In today’s digital age we all expect to find the information we need at the touch of a button, whilst ensuring scientific rigour and robustness of data. So, why use inefficient paper systems involving large dossiers, written reports and multiple data repositories for presenting and sharing evidence? 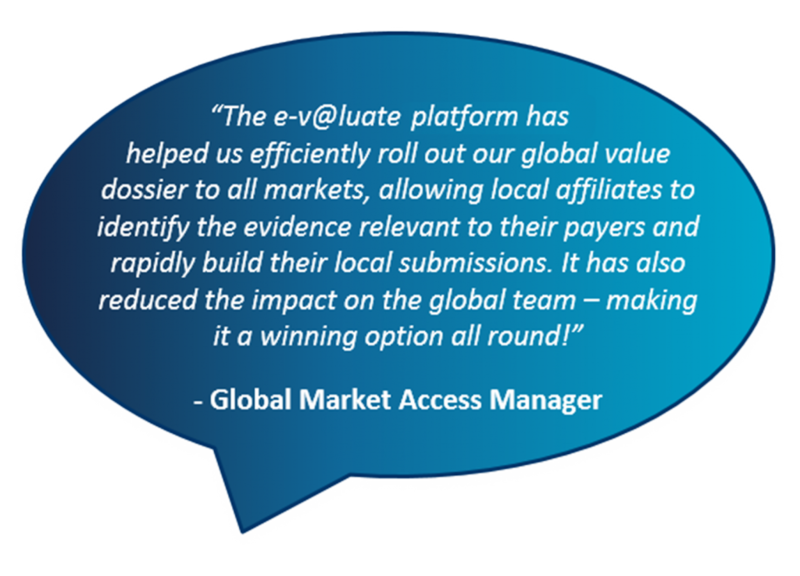 This is why we developed e-v@luate – a suite of tools tailored to help fully optimise your market access activities and ensure the full value of your product is communicated. The e-v@luate EVIDENCE digital platform is a web-based, interactive, digital evidence platform which allows tailoring of evidence and value messages, targeted searching and retrieval of data to meet specific regional and local affiliate needs, without needing to review lengthy reports. A seamless, user-friendly tool to visualise health economic information and communicate the economic value of your product, providing innovative data visualisation fully aligned with the payer value proposition. A web-based and tablet-friendly solution with focused content relevant to the specific payer audience, it contains integrated usage tracking statistics and is a user-friendly way to highlight the economic value of your product. 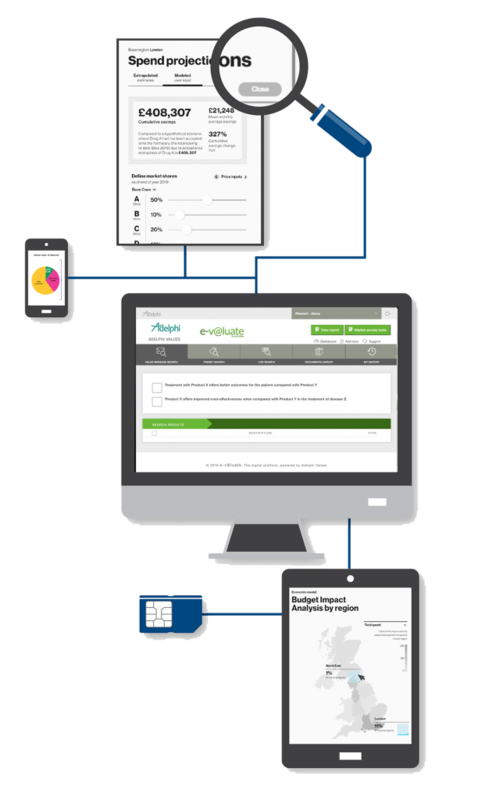 A simple, interactive and easy-to-use communication tool to support face-to-face interactions with payers, providing tailored presentation of the evidence to meet specific payer interests and questions. With centrally controlled updates, it allows multi-level presentation with the option to explore detail as required and has options for analytics and measuring use. A data capture app, tailored to meet your needs and demographics, to facilitate understanding of your target populations including HCPs, payers and patients. Designed to provide tailored questions to your needs and demographics following template or de novo questions, it offers central reporting and data interrogation with rapid results to understand perceptions in your target populations.